The process whereby ammonia in wastewater is oxidized to nitrite and then to nitrate by bacterial or chemical reactions. Nitrification is the biological oxidation of ammonia with oxygen into nitrite followed by the oxidation of thesenitrites into nitrates. 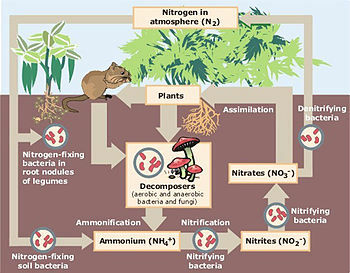 Degradation of ammonia to nitrite is usually the rate limiting step of nitrification. Nitrification is an important step in the nitrogen cycle in soil.